They are attentive to your concerns and needs. They are both very knowledgeable and experienced, confident but without ego, rare to find in the LA area, very modest and down to earth. They focus on what will work best for you and your look, not what is 'the look'. They use state of the art technology for assessment, projections and results. If you suffer from rosacea, you likely feel frustrated by persistent redness, spots, and regular flare-ups of the condition. While mild forms of the condition can be concealed with makeup, more advanced cases require medical intervention. In our Beverly Hills practice, we have found great success in treating facial redness and other symptoms of rosacea with the IconTM Aesthetic laser. 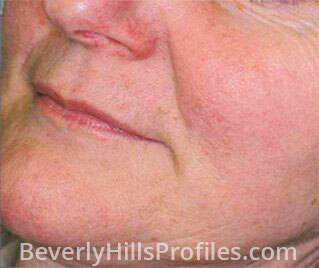 Female patient who suffers from Rosacea and treated with the Icon Aesthetic laser system. How was Beverly Hills Profiles founded? There are a variety of treatments for rosacea, ranging from topical medications to systemic drugs to laser treatment. At JolieMD, our expert team of facial plastic surgeons and nurses can evaluate your skin and prescribe a customized regimen using the Icon Aesthetic laser system. If you are under the care of another dermatologist, we often working in partnership with your dermatologist to ensure that you receive holistic treatment for rosacea. The Icon laser platform features several different laser heads, allowing us to customize your treatment to correct specific symptoms of rosacea, including broken capillaries, thickened skin, and overall redness. If you suffer from rosacea, we encourage you to contact our expert team today. Rosacea is a chronic skin disorder that is most commonly seen in people with light skin, particularly those of Celtic descent. It is more prevalent among women, but tends to be more severe in men. Rosacea usually affects people in their 30s or 40s and fluctuates in severity until it clears up later in life. Rosacea is rarely seen in elderly people. Both Doctors are AMAZING. Both my husband and I have had several procedures done with Dr. Litner and Dr. Soleiman. They far exceeded our expectations. I appreciate the time they spent with us going into detail about our respective procedures, answering a multitude of questions. Highly recommend their services to all family, friends and anyone looking for first rate plastic surgeons. I am consistantly treated with kindness and everytime I walk through the doors at Profiles I know I am in safe place. I could never thank Dr. Solieman and Dr. Litner enough for the constant support and beautiful work. In this world of plastic surgery we all know it can get a bit scary but with profiles you can always trust that you will end up with more beauty then you could of even imagined. Rosacea usually begins as small, raised red spots on the nose, forehead, cheeks, or chin. These spots often appear in groups of two or three and persist for about two weeks before they flatten and fade. As soon as one set of spots clears, another set starts to appear. Without treatment these flare-ups will continue, typically in response to certain triggers, until a noticeable redness has spread across the center of the face. 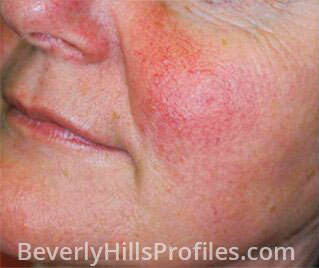 After rosacea spots have resolved, redness in the area can persist for months or even years. In addition to spots, individuals with rosacea tend to redden or flush easily in response to changes in temperature, certain foods, and alcohol. For the majority of rosacea sufferers, the main concern is diffuse redness across the face; however some individuals will experience more severe effects. Ocular rosacea can affect the eyes and eyelids, causing redness, irritation, light sensitivity, and blurry vision. Rosacea can cause the thin to thicken and form irregular nodes on the skin. This can occur on the chin, nose, cheeks, eyelids, and forehead and can cause serious disfigurement. In rare cases, the nose may be become dramatically enlarged, requiring surgery to correct. We recommend that our Los Angeles patients keep a journal to record changes in their skin and possible triggers that may have caused them. * Free consultations are available for non-surgical treatments. Paid consultations are required to discuss surgical procedures.